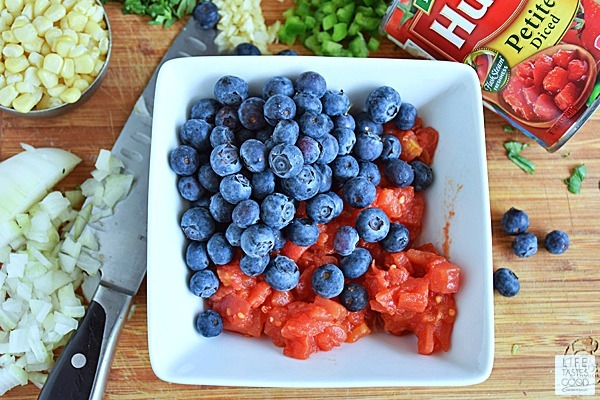 Red, White, and Blueberry Salsa is a unique blend of sweet & spicy that is perfect with your favorite chips, but also delicious as a topping for fish, chicken, and even pork for an easy dinner any night of the week! 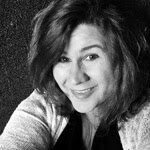 The temps are already well into the 90's here in FL, so we are in for a long hot summer. 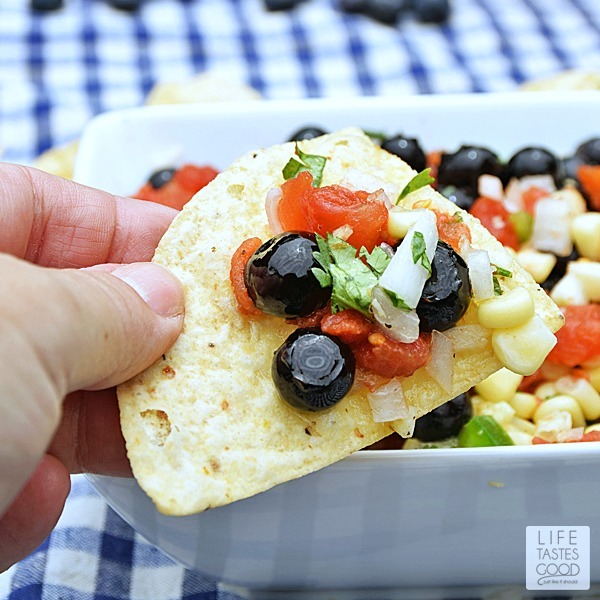 A refreshing salsa is a great way to enjoy a snack with friends and stay cool at the same time. It is the perfect addition to all of our summer festivities, such as the first day of summer, 4th of July, family reunions, and all of those wonderful summer barbecues! 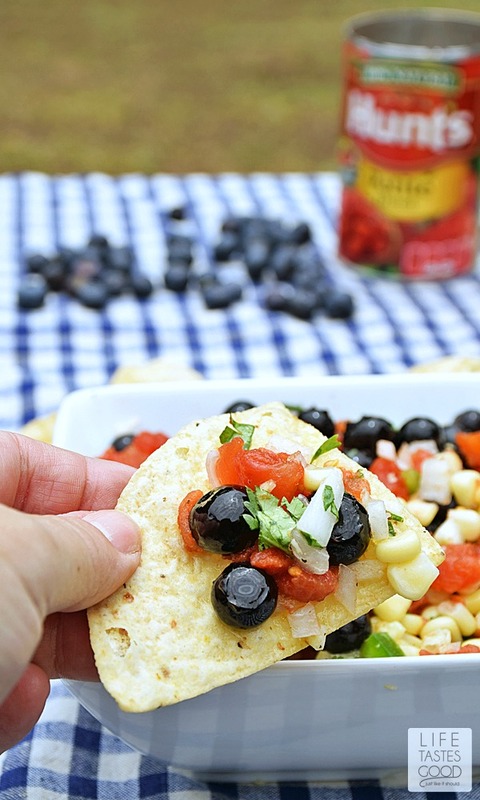 Not only is this beautiful salsa patriotic with the vibrant red, white, and blue colors, but it is also super easy to make and delicious too! Using Hunt's Diced Tomatoes makes quick work of this salsa by eliminating the need to blanch the tomatoes. Hunt's takes care of that for us! These tomatoes are flash steamed with only water for safe removal of the peels. There is just no time for being stuck in the kitchen blanching when summer fun is happening!! I like to take my cutting board outside to be close to the festivities while I make up this salsa. 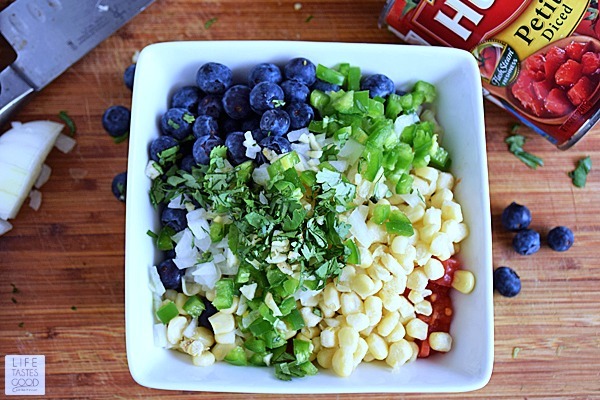 With just a little bit of chopping and tossing, I can create this colorful bowl of deliciousness in about 10 minutes!! Doesn't get much better than that for easy summer entertaining! mix it up, give it a taste, and adjust the seasonings as needed. Serve and enjoy! 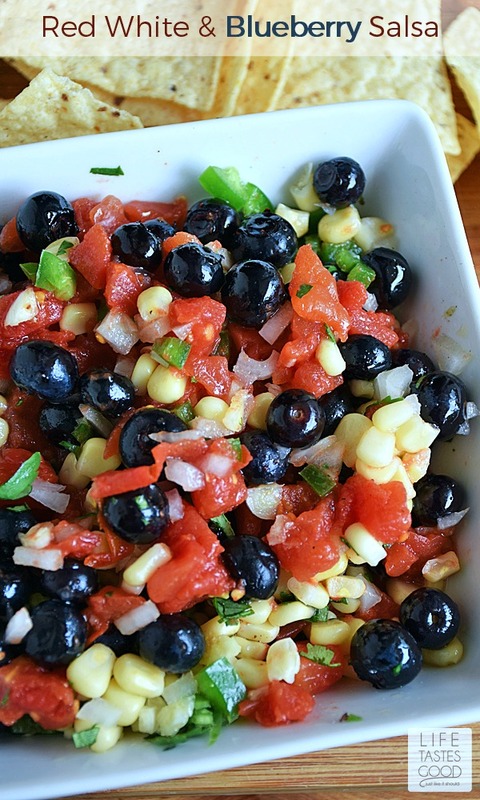 In a serving bowl combine the drained tomatoes, 1 cup blueberries, 1/4 cup chopped white onion, 1 tablespoon freshly minced garlic, 1 seeded and minced jalapeno, 1 tablespoon freshly chopped cilantro, 1/2 cup white corn, and salt and pepper to taste. Gently toss the ingredients to mix well. Give it a taste and adjust the seasonings as needed. Serve and enjoy! I see it with fresh ingredients not canned or frozen. Sorry Hunts. Maybe in the Winter when fresh items are not so good.